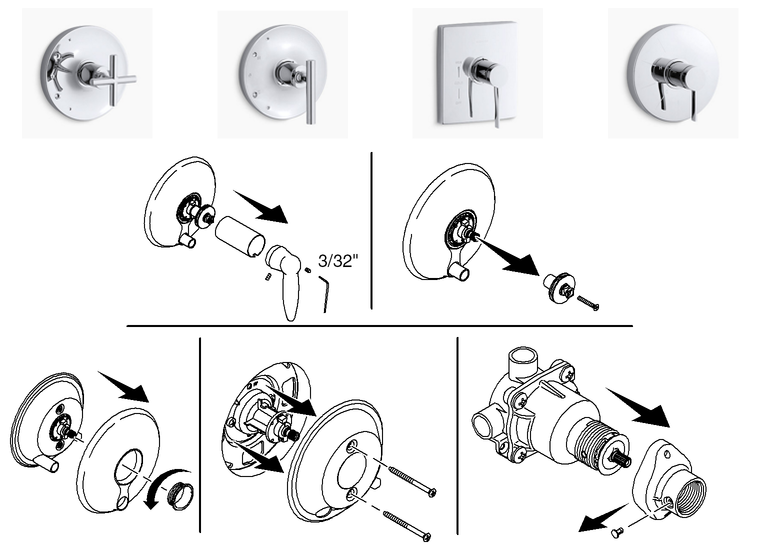 This document is intended to help identify and remove the trim from your KOHLER single-control bath or shower valve. 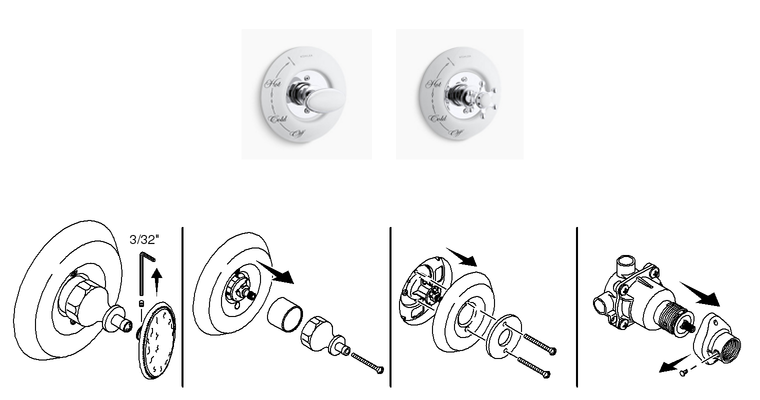 Identify your valve trim by referring to the thumbnails, then follow the instructions listed below the image to remove the trim. 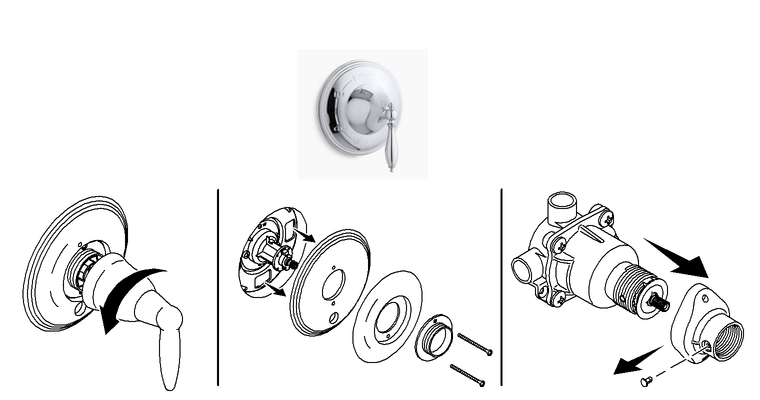 The images showing how to remove the valve trim may not look like your trim. The instructions still apply. Cover the drain with tape to avoid the loss of any small parts. Keep track of all trim components. You will need them in order to put your trim back together. You may need the following tools to remove your trim: 3/32” hex wrench, Phillips screwdriver, and a flat-blade screwdriver. 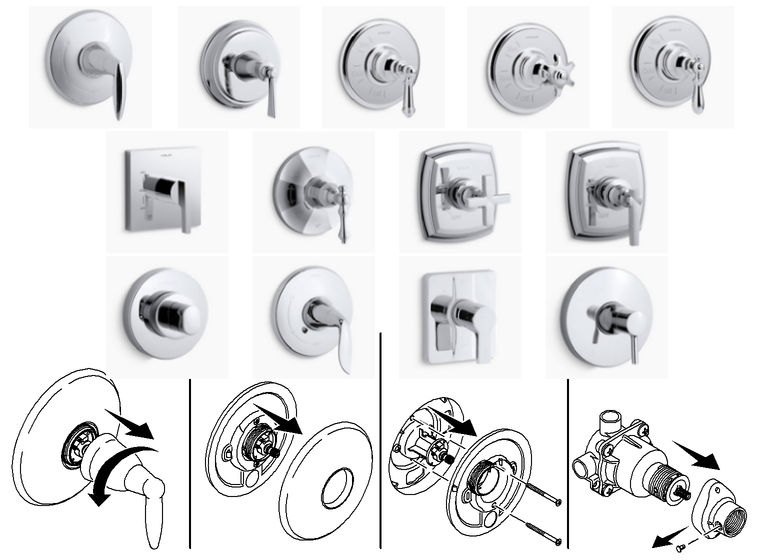 Once you have removed your valve trim, the documents listed below are available to help you identify your shower valve. 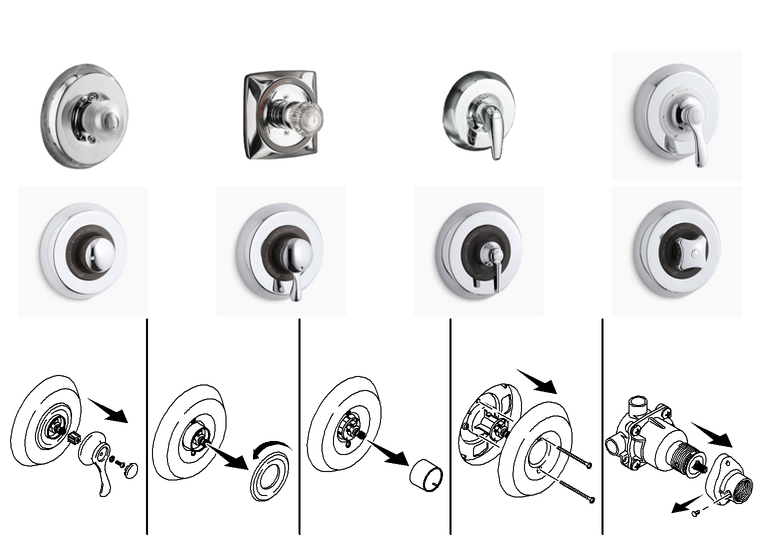 How Do I Identify My Single Control Bath/Shower Valve? If your trim has a diverter button, remove the button before attempting to remove the valve trim. 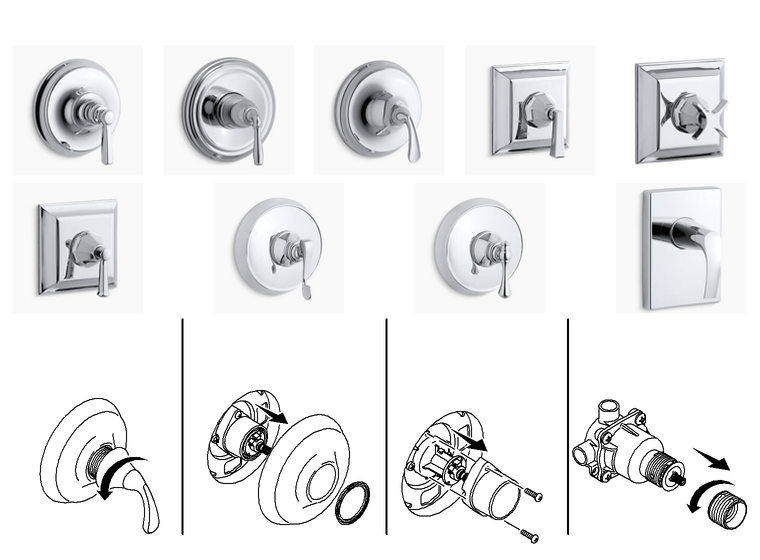 If your trim does not have a diverter button, move on to identifying your valve trim. Diverter buttons can be removed one of three ways. Follow the appropriate instructions below to remove your diverter button. You may need the following tools to remove your diverter button: 1/16” hex wrench, flat-blade screwdriver, and a pliers. Unthread the knob from the end of the diverter button. Using a flat-blade screwdriver, hold the diverter stem in place while unthreading the diverter button. Unthread and remove the diverter button. Unthread and remove the diverter sleeve. Once the sleeve is removed, you should be able to remove your valve trim. After you have removed your valve trim, hold the diverter stem in place. Unthread and remove the diverter button. After you have removed your valve trim, locate the setscrew or setscrews on the diverter button. Using a 1/16” hex wrench, loosen the setscrew or setscrews and remove the diverter button. 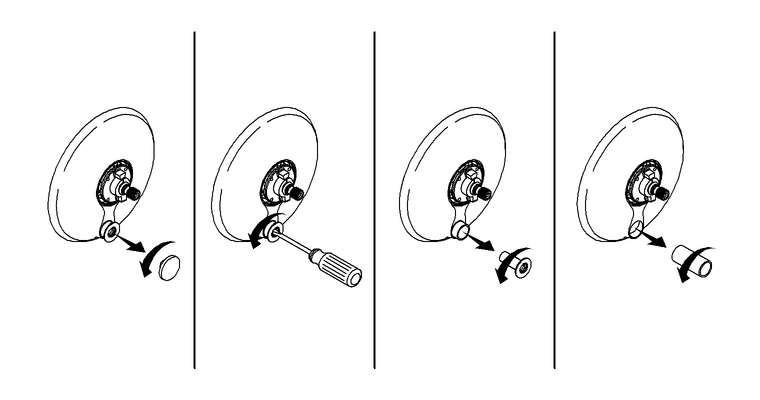 Using a Phillips screwdriver, unthread the screw and remove the handle, bonnet and sleeve from the valve stem. Using a Phillips screwdriver, unthread the two screws from the faceplate. Remove the escutcheon and the faceplate. If applicable, use a flat-blade screwdriver to remove the pin from the adaptor. Unthread and remove the adaptor from the valve. Using a flat-blade screwdriver, gently pry the plug button from the front of the valve trim. 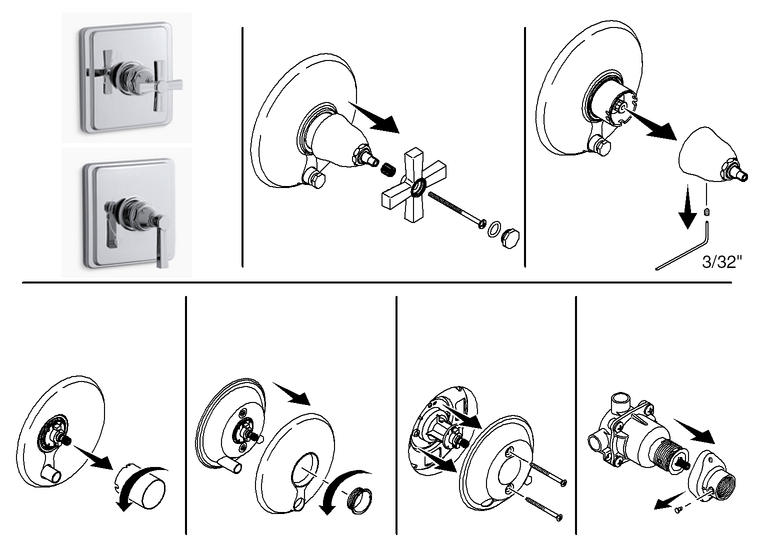 Using a Phillips screwdriver, unthread the screw and remove the handle and adaptor from the valve stem. If applicable, rotate the cover counterclockwise to remove. Slide the sleeve off the valve. Using a Phillips screwdriver, unthread the two screws and remove the faceplate. Using a 3/32” hex wrench, loosen the setscrew and slide the bonnet off the valve. Turn the sleeve counterclockwise and remove it from the valve. Unthread the collar. You may need a special tool (K-87448) to unthread the collar. Remove the faceplate and the collar. Using a Phillips screwdriver, unthread the two screws and remove the seal plate. Using a 3/32” hex wrench, loosen the two setscrews. You may need to rotate the sleeve to access both setscrews. Slide the handle and sleeve off the valve. 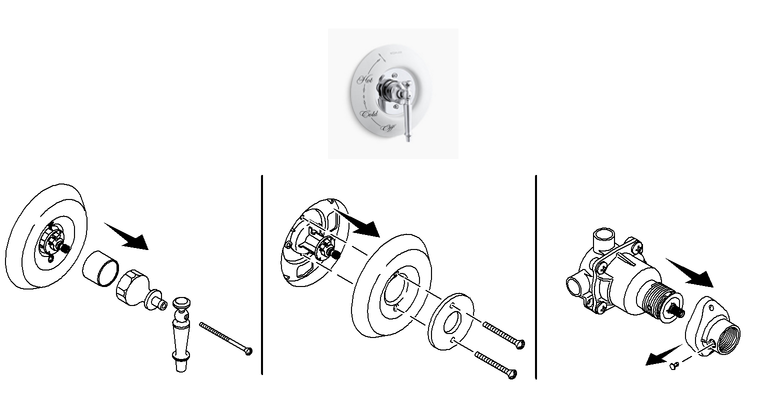 Using a Phillips screwdriver, unthread the screw and remove the adaptor from the valve stem. 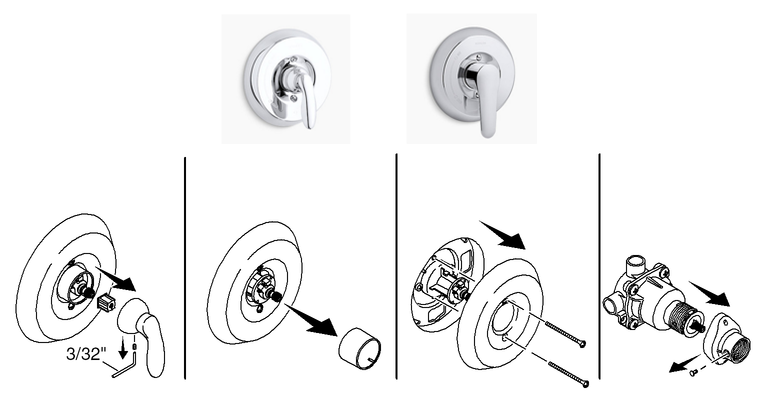 Using a 3/32” hex wrench, loosen the setscrew and slide the handle off the valve trim. 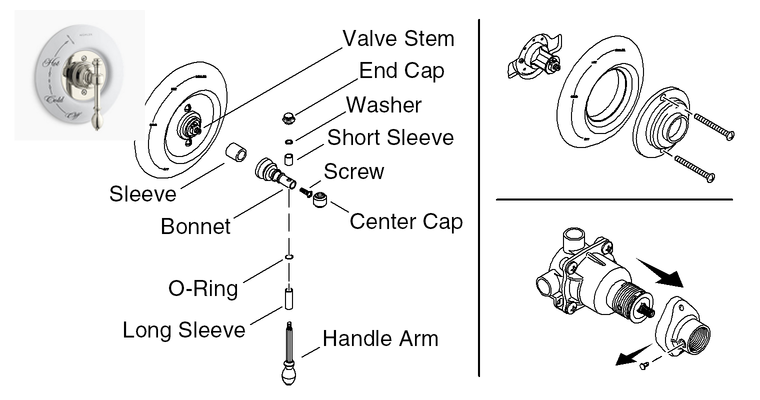 Using a Phillips screwdriver, unthread the screw and remove the bonnet and sleeve from the valve stem. Using a Phillips screwdriver, unthread the two screws from the faceplate. Remove the washer and the faceplate. 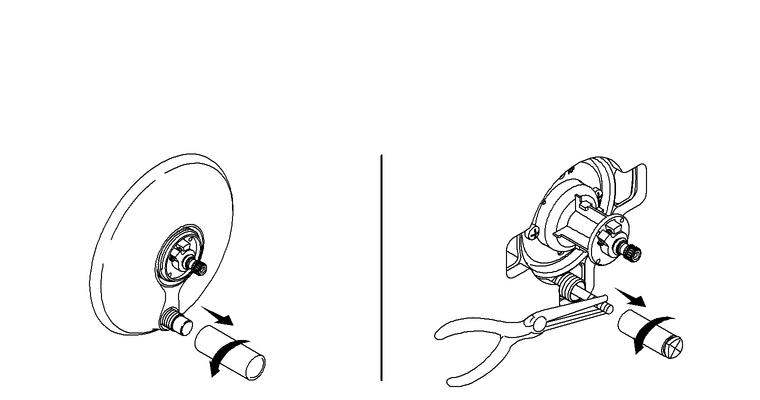 Using a 3/32” hex wrench, loosen the setscrew and slide the handle and adaptor off the valve. Using a 3/32” hex wrench, loosen the two setscrews. Slide the handle and bonnet off the valve. Gently pry the cover plate from the escutcheon to expose the two screws. Using a Phillips screwdriver, unthread the two screws and remove the escutcheon. Firmly grasp the handle. 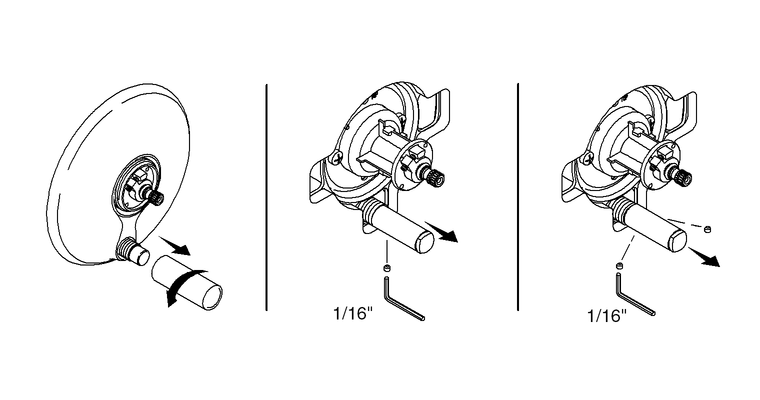 Turn the bonnet counterclockwise and remove the handle and bonnet from the valve stem. Remove the faceplate from the seal plate. Firmly grasp the handle. Turn the bonnet counterclockwise and remove the handle and bonnet from the valve. If applicable, remove the pivot ring. Remove the faceplate from the valve. Using a Phillips screwdriver, unthread the two screws and remove the retainer. If no screws are present, unthread and remove the retainer. Using a Phillips screwdriver, unthread the two screws and remove the handle sleeve, shroud, and faceplate. While holding the handle arm, unthread the end cap. Remove the end cap, washer, and short sleeve. Slide the handle arm from the bonnet. Ensure the O-ring and long sleeve are still in place. Slide the center cap from the bonnet. Using a 3/32” hex wrench, unthread the screw from the bonnet. Slide the bonnet and sleeve from the valve stem. Using a Phillips screwdriver, unthread the two screws from the escutcheon assembly. 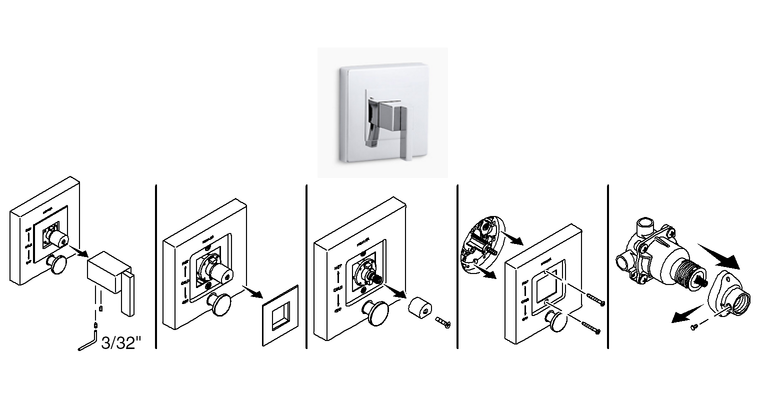 Remove the escutcheon assembly and the faceplate.